12 trekking days, climbing up, down and around. Stone stairs and rough trails. Over babbling streams and icy wild rivers. Through forests and valleys. Over a glacier or two, and through an avalanche zone. Just a compass and map to guide us. 11 nights cosied up in sleeping bags, in draughty wood and stone huts, often layered up in everything we own. 10 + 10 frozen digits on the snowy morning's climb to Annapurna Base Camp and ten mountains in the 360 degree panorama of the Annapurna Sanctuary. 9+ nationalities met along the way and more than nine bridges there and back; some strong steel and stone, others icy, slippery logs. 8 lungs fit to burst on reaching 4000m and eight weary sore legs at the end. 7 Mars and Snickers bars for power to keep putting one foot in front of the other and seven creatures seen and unseen: snow leopard, musk deer, eagles, himalayan weasel, pack horses and donkeys, and the legendary Yeti. 6am starts, rising and sleeping with the sun, and six smelly socks used in rotation. 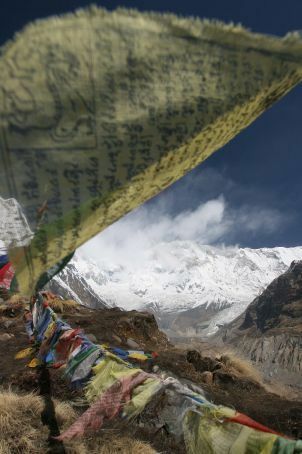 5 colours of the Tibetan prayer flags strung up, five top layers on the base camp days and nights, and "Five more minutes" said Thellie, "just round that bend, over that ridge...", never true. 4 bright red and pink tikka-ed faces in celebration of Holi, four sick days and four meals missed on the way up, and four greasy hat heads after living in them for six continual days. 3pm naptime, after the day's walking is done and the afternoon rain and snow creep into the valley, three packs per porter for every trekker's one, and nearly 3000m: the total elevation gain. 2 hot showers, one up, one down, two slightly charred shoes belonging to Tom, and two near misses for Tom and I crossing icy boulders on the Modi Khola. Things too many to quantify: dishes of dhal bhat eaten by all, games of cards and subsequent accusations of 'fix, 'cheat' and 'jammy git', steps taken up and down and shouts of "Not another uphill", goose pimples creeping in and spreading under thermals at Macchapucchre Base Camp, and positive adjectives to describe the view and feeling of finally reaching the top. 1 crunchy, dodgy knee collapsing on Dawn on the way down, one trekker's card and permit, pack, walking stick and yak wool hat each, and one awesome panoramic view on reaching our destination: Annapurna Base Camp at 4130m.